Dogs4us running scared from the truth! Dogs4us runs a blog where they attempt to intimidate campaigners by posting pictures of them and their homes, this doesn’t bother anyone but as the business has so few customers there is little else for them to do but post online. 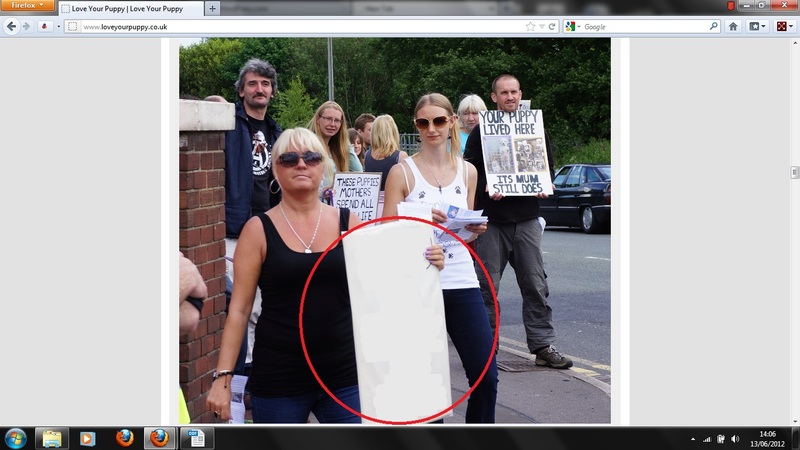 What was interesting this time around was that the picture they had posted of the protest had one banner blanked out. All the other banners were intact and displayed on their website but one was not. Why? Because that banner stated ‘Exposed by Channel 5 News and Sky News’! That one banner exposed the truth that Dogs4us want to hide – that this isn’t the ravings of extremists but a carefully researched campaign that started with an undercover investigation that even the mainstream press covered! Here is the Channel 5 News video that Dogs4us don’t want you to see! Dogs4us also took a picture of a child protester and posted it on their blog without the mothers permission. This young lad who voluntarily chose to spend his Sunday holding a sign – because he loves animals so much and hates what Dogs4us do – should be commended not ridiculed. He does not deserve to have the perverts at Dogs4us taking his picture. But that is the lengths Dogs4us will go to hide from the truth! So now you know. Join the campaign and refuse to buy anything from Dogs4us while they still sell puppies! Dogs4us you can run from the truth but you can’t hide – see you soon! I was one of the customers that you gave a leaflet to on Sunday. having read the leaflet and looked at your website, i will never go to Dogs4us. It’s disgusting they are still in business – not surprised they didn’t us to see the tv footage!! @Sue – Congratulations Sue! I admire you for taking the ethical decision not to shop at Dogs4Us. Sue .. may i also thankyou for taking the leaflet .. and after reading it .. making the ethical decision to not shop at Dogs4Us ..